The sigua tree is in bloom now and I’m working on getting an identification for it. It’s one of those hard ones – in the laurel family – and the locals are smart enough not to try to key it out. They just call it a sigua (from Cuba, cigua, meaning a laural tree), never mind that there are two species called sigua, two called sigua blanca (white sigua), and one called siguita (little sigua) as described by Carrasquilla. But this post is not about the identification of sigua. It is about something this particular sigua is undergoing, something that is a natural part of competition in the neotropics, but which has recently become a cause for some concern. More on that in a bit. 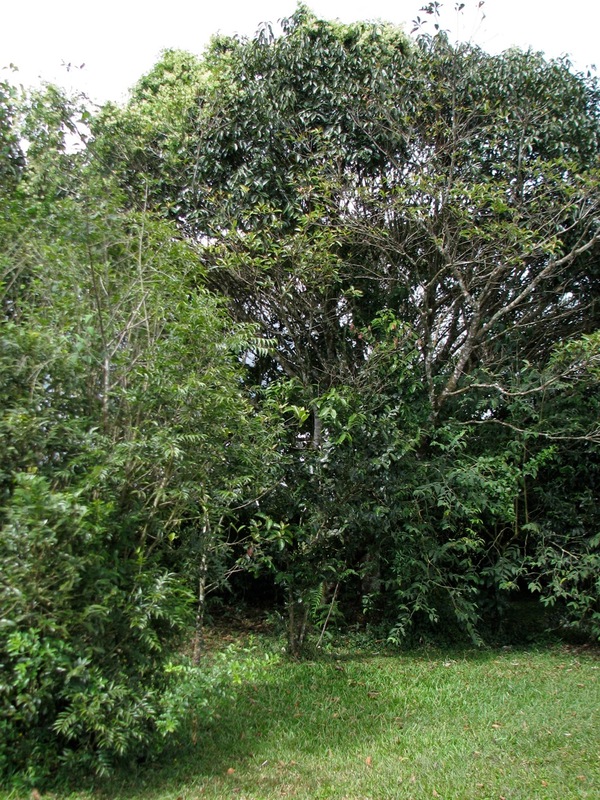 The sigua is the tall dark-leaved tree in the background. 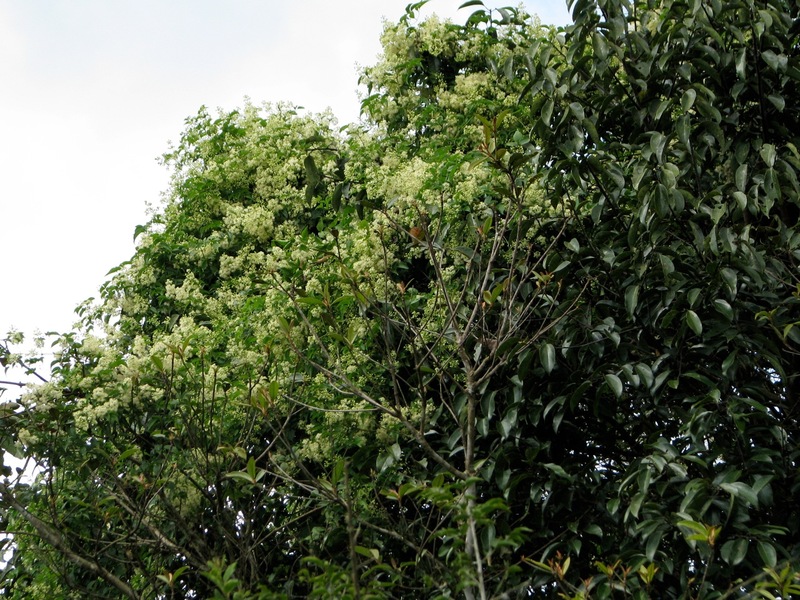 Last November & December, I saw flowers on the top of this tree (the light green color to the left on the sigua top), and I knew they were not sigua flowers. I walked under the tree and looked up. There they were, white flowers, looking very much like they belong to the Aster family, Asteraceae. [Update: Or maybe not. See comment by The Phytophactor below. Cactaceae? or Ranunculacae? The puzzle of the liana’s name, like that of the sigua, remains to be solved.] So I started tracing the branches downward so I could see where the plant originated. 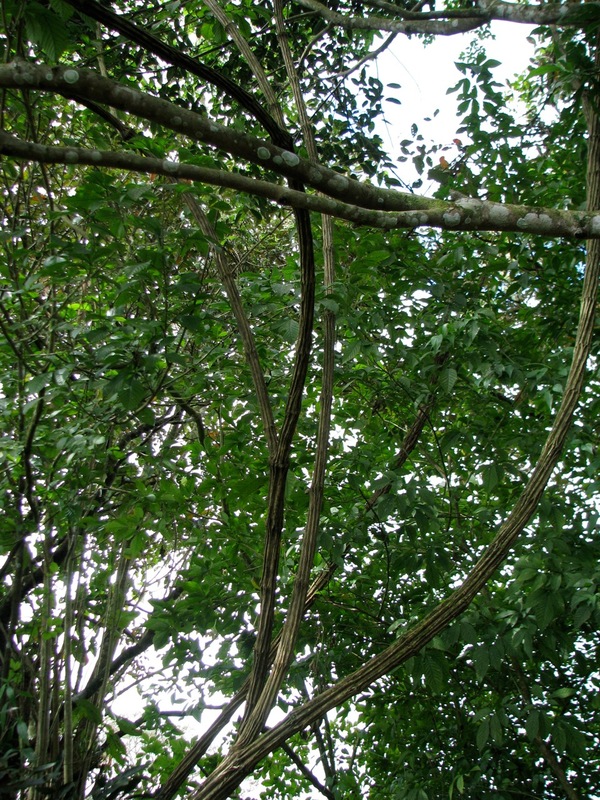 Here you see a branch of the sigua tree running horizontally across the top third of the image. 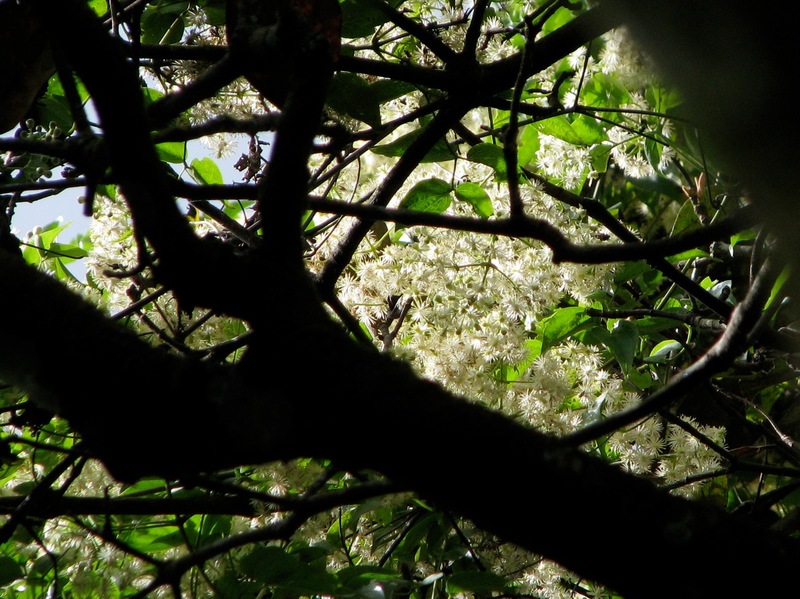 The more or less vertical branches lead down from the flowers. 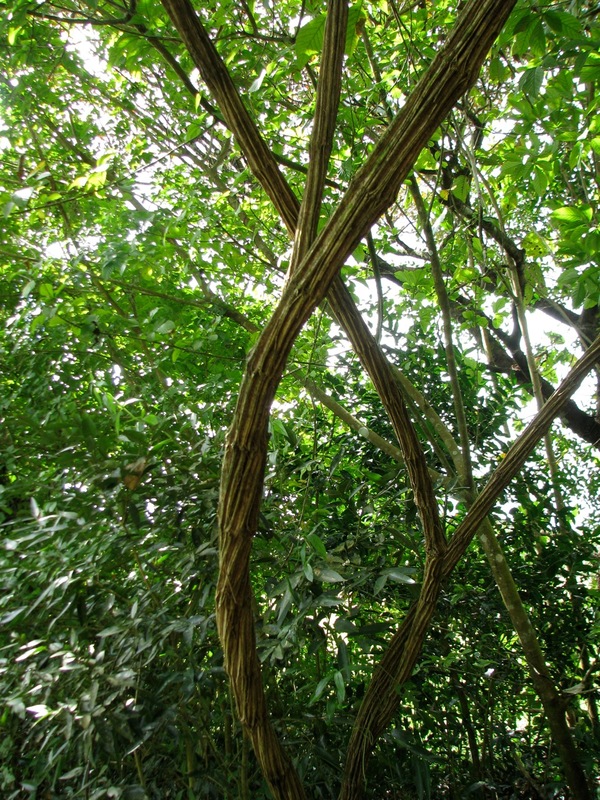 It’s a liana, which is a woody vine. 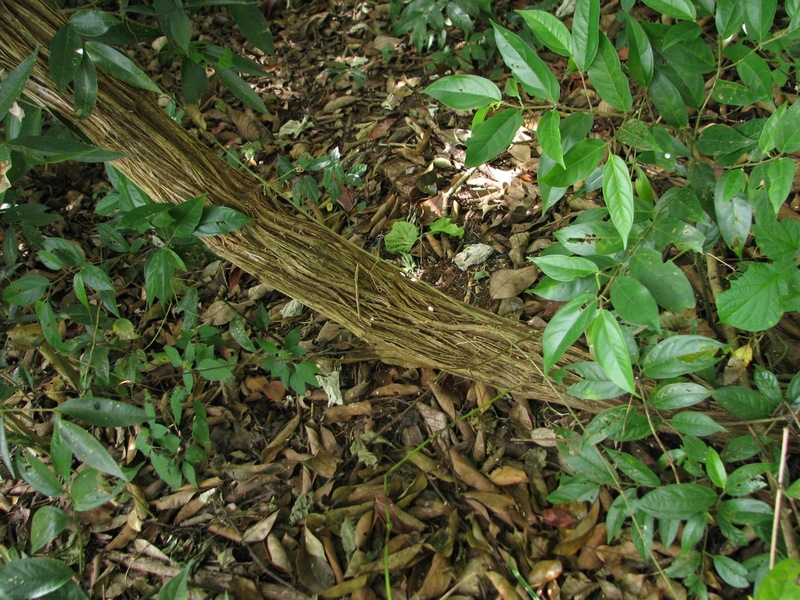 You’ll see lianas called vines and vines called lianas in the popular press, but the proper usage of liana is for woody vines only. I’m a little concerned that this liana might damage the sigua. Lianas, I have read, can so overgrow a tree that the leaves of the tree itself cannot get the light they need to photosynthesize. Plus, since they’re rooted in the ground and take water and nutrients from the soil, they compete with the tree’s roots as well. I went online to find some recent work to support this statement, and I came upon a startling article published just this month at the Smithsonian Tropical Research Institute site: Scientists race to determine why vines are taking over forests in the American tropics. 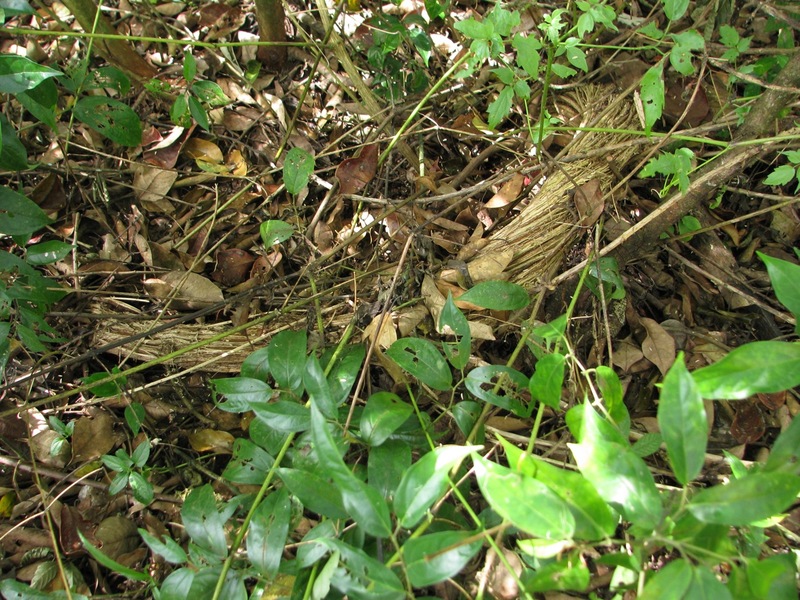 On Barro Colorado Island in Panama, the proportion of vines in tree crowns has more than doubled over the past 40 years. 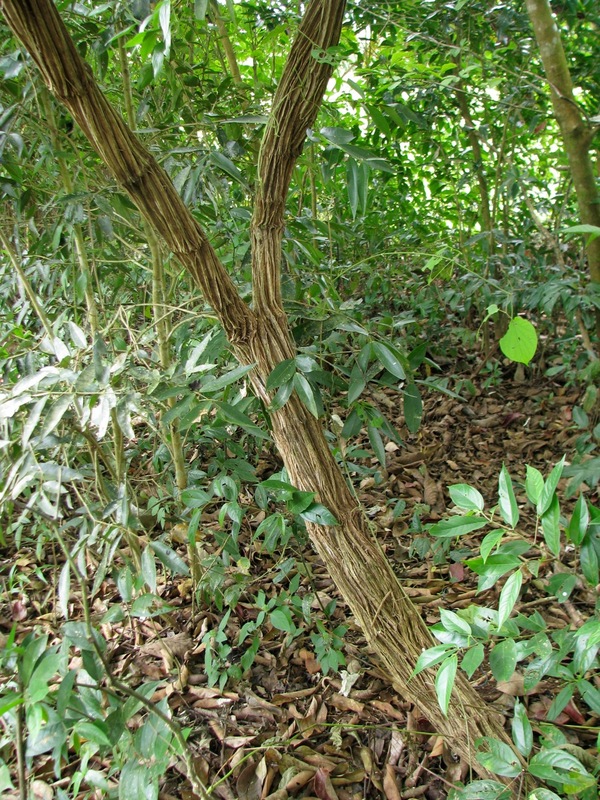 In French Guiana, liana vines increased 60 percent faster than trees from 1992 to 2002. What to do, what to do. Should I let nature take its course, whatever that may be, or should I protect the sigua, which produces fruits greatly enjoyed by birds? This entry was posted in Asteraceae, Lauraceae, Panama, PostAweek2011 and tagged Barro Colorado Island, Smithsonian Tropical Research Institute. Bookmark the permalink. What you got there? Hard to really see enough details, but if each is actually one flower, not a head as in Asteraceae, then that’s a lot of perianth parts and has me thinking Cactaceae, like Pereskia or Ranunculacae, like Clematis. What falls to the ground? You’re right – the details are hard to see, and I didn’t see flowers on the ground last Nov/Dec. However, now that you suggest they may be individual flowers and not heads that I’m looking at, I can see your point. And after Anne commented (below) that the plant reminds her of her Clematis, the two of you may have given me a good lead. I guess I’ll need to leave it intact at least until next Nov/Dec so I can work on the flowers. 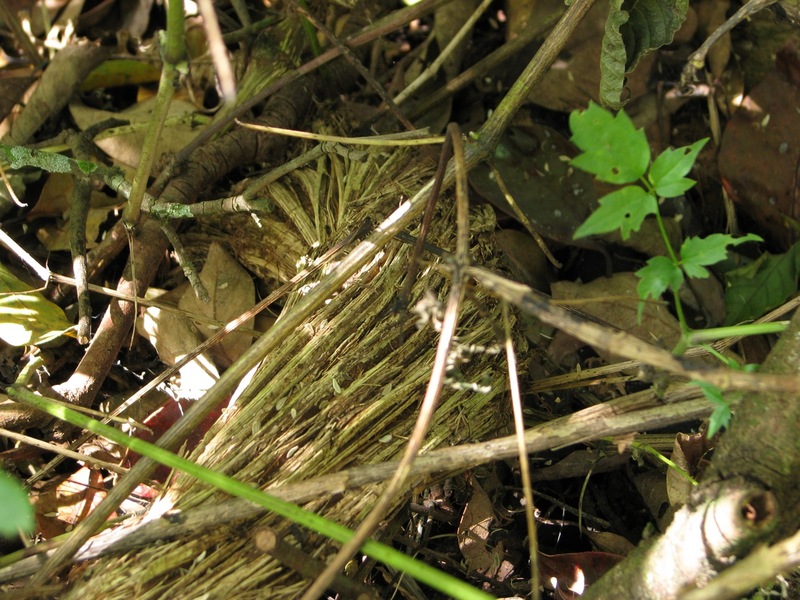 PS – I’ve just checked the online resource for Lianas of Panama (http://tinyurl.com/5s9whnz), but, oddly, neither family Cactaceae nor Ranunculacae are listed there. I’ve just found the resource so I have no idea how complete it is. You’ve got me really curious now. The vine itself looks a lot like my Sweet Autumn Clematis. I occasionally cut it back before it shades out its host. I had not heard about this proliferation of vines–puzzling and disturbing. That’s a good idea and it gives me an option – cut this liana back periodically but don’t kill it. Thanks for that thought. The idea that it might be a member of the family that Clematis is in, is very helpful. Thanks! It might not be a native liana. Clematis can be rather weedy in its ability to spread to new locations. And as AM points out, the vine its self has that twisted twine look of the autumn clematis. Ours grow as a herbaceous perennial, usually dying back to the ground, but in a tropical climate it could become a real woody plant. Okay, very good. Thanks, Phytophactor. I’ll dig deeper in that direction. I have no idea what the plant is, but poison ivy grows in a similar fashion in the panhandle of WV. Argh! Must be nasty there.